For others named Diane, see Diane. "You're not doing this fast enough. You're fired too!" 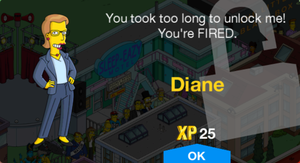 Diane is a network executive at Krustylu Studios. She and the other executives wanted to cancel Krusty and replace it with Homer's show. She is the one who fired Jeremy. This section is transcluded from The Simpsons: Tapped Out characters/Network Executives. To edit it, please edit the transcluded page. Modified on July 11, 2018, at 11:07.